RALEIGH, N.C. — North Hills took a trip back in time Thursday morning when officials unearthed a time capsule buried 50 years ago. The capsule was buried June 8, 1967, in the sidewalk outside of the Cardinal Movie Theater. The capsule was part of the Cardinal’s opening day festivities. The space is now between Verizon and Bonefish Grille in the Lassiter District of North Hills. Local businesses and students from nearby schools contributed items to the 1967 time capsule. 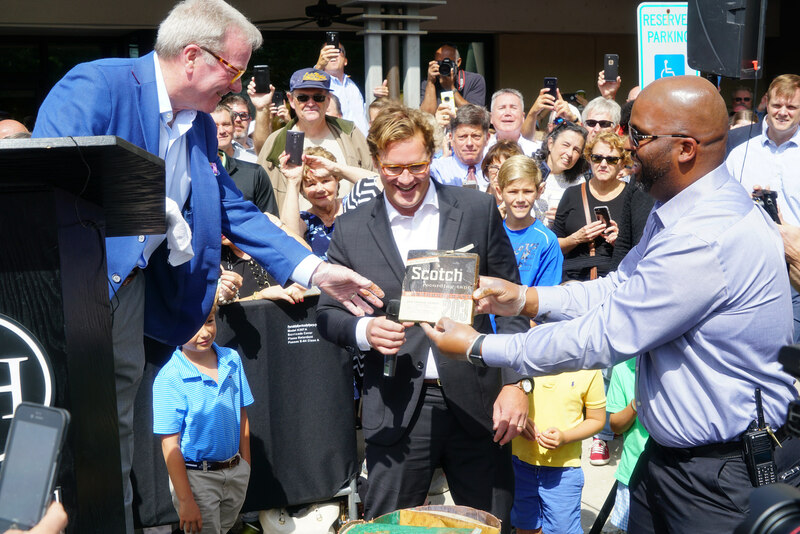 During a ceremony outside of Bonefish Grill, the capsule was opened revealing a variety of audio recordings and news clippings. Other items included movie tickets to the Cardinal, a North Carolina manual from 1965, a key to the city and a list of vital statistics for the City of Raleigh for 1967. Water had leaked into the capsule, leaving much of its contents wet, and requiring the delicate removal of some documents that were not stored in plastic. Bonner Gaylord, managing director of North Hills, said they would be working with the City of Raleigh Museum to help preserve and analyze the capsule’s contents. In conjunction with the event, North Hills buried a new time capsule that will be opened in 50 years. The capsule will contain contributions from local schools, the Greater Raleigh Convention and Visitor’s Bureau, Midtown Raleigh Alliance, Kane Realty, News and Observer and WRAL. Contents included a copy of David Sedaris’ book, Theft by Finding Diaries, a fidget spinner, Carolina Hurricanes mini hockey stick and copies of various publications.